A demonstration project is now underway in Colorado to determine how solar power integrated into an active coal power plant can reduce coal consumption and lower emissions. The demonstration taking place at the Cameo coal power plant, near Grand Junction, Colorado, is truly the first of its kind in the U.S.
Xcel Energy, Colorado's largest electric utility, has recently added parabolic trough concentrating solar power (CSP) to the Cameo power plant to see if the solar power will cost-effectively bring down coal consumption as well as emissions. Xcel selected Abengoa Solar in 2009 to supply the technology, and the solar/coal project became operational this past March. If the industrial solar installation proves to be as effective as everyone anticipates, there is a likelihood that it will lead to larger installations in the future. Cameo's size and longevity made it an ideal test candidate to determine if parabolic trough technology would work with larger U.S. coal power plants. Cameo is a small coal power plant-about 44 megawatts (MW)-and at 40 years old, it is coming to the end of its life cycle. Hank Price, director of technology at Abengoa Solar Inc, describes their parabolic trough technology simply. "It's a solar thermal technology. The sun's heat is collected in parabolic trough collectors that focus light on a receiver tube that heats up a fluid circulating in the collector. The hot fluid is run back to the power plant and used to provide thermal energy in the power plant, for running a steam turbine." Abengoa Solar is hardly new to this kind of technology. They have similar, large-scale operations in Spain and North Africa. It was, however, the first time the company used this particular solar integration. "With Cameo, it's a low risk opportunity to test the concept to make sure it works before investing large sums in massive systems," adds Price. "Utilities want some comfort there will be no adverse effects before making those big investments." Xcel put the project out to bid in 2008. It provided companies with the general concept and the design of the coal plant. Interested companies provided technical proposals and, from those that responded, Abengoa was selected. 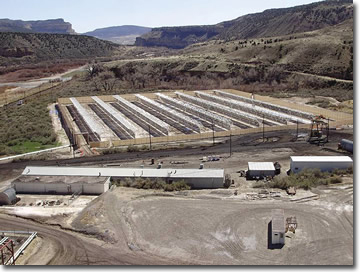 The Colorado Public Utilities Commission approved the Cameo project in June 2009, and the site grading work began in August. Abengoa provided the collector design for the solar project, but they looked to other vendors to provide the other pieces-the collector (made from extruded aluminum) came from the Hydro Aluminum North America plant in Phoenix, Arizona; the mirrors were provided by Rioglass Solar S.A in Spain; and the receiver tubes were purchased from Schott Solar in New Mexico. It looked like everything was well on its way until Colorado was hit with one of its worst winters ever. Construction slowed as contractors worked in sub-zero temperatures. "We were told that it was the first year they had ever seen the Colorado River freeze over," says Price. Winter didn't stop the team, though. By the end of March, the technology became operational and heated fluid began circulating into the Cameo plant. "Another challenge that delayed things a little was that we're using a new parabolic trough collector technology," says Price. Abengoa chose to use a new collector design rather than use its older collector design because it required less on-site construction, which was an important factor when working through snowstorms. Price admits, however, that using the new collector technology-built of aluminum and designed to be assembled with less labor on site-was a bit of a risk. "The parabolic trough collector we use in Spain is a very optimized design for assembling on site, but it's built in a mini-factory that works like an automotive assembly line. We have a very optimized process for how to do that cost effectively," says Price. "That design requires, however, a lot of equipment and it takes a fair amount of trained labor as well, and is best suited for large solar power plants. "With this small project at Cameo, we decided that wasn't the way to go. We made the decision to go with the new collector design." Both Xcel and Abengoa are glad they went with the new design. It went up easily, even in the cold weather, and it is working well. People don't generally think of coal and solar working well together, but Price says that coal plants are a good niche market for this type of solar technology because solar can be easily tied into an existing power plant. "I think as utilities become interested in adding solar power cost effectively to their system, this is going to be a good match," says Price. "It's low cost, and it's an efficient use of energy." Why is it low cost? Price says that by tying solar power into an existing power facility, you save the cost of building the conventional part of the power plant, which can be 40 percent of the cost of a standalone parabolic trough solar power plant. In addition to saving on construction costs, the company also saves money on maintenance and operations. If a coal plant is considering incorporating solar energy, there are a couple of obvious requirements-a sunny location for the power plant and available land nearby for solar collectors, approximately five acres per megawatt. At Cameo, solar energy isn't completely repowering the plant, says Price. "We're only providing a small percentage of the total energy input to the plant. In the Cameo project, we're only providing 1 MW of solar to a 44 MW plant to demonstrate the concept. However, in future projects, 10 percent or more of the energy input to the plant could come from solar." The good news, he says, is that by using this solar technology, you can add solar power without adversely affecting the power plant-you're just tying into the existing system. "That's one of the unique things about this project-the way that we're integrating solar," says Price. "It is an idea that has been around for years, but this is the first time it has ever been tried. It has very little negative impact on the coal power plant, and that's the real advantage of this approach. "The way the steam cycle is set up, it will automatically regulate the power plant when solar heat is available. You don't have to actively control the addition of solar into the power plant, the turbine cycle will automatically adjust. "The goal is to find out if this technology works as well as we hope it does," adds Price. "Coal boilers are sensitive. You don't want to overheat parts and/or cause emission problems. If done correctly though, the integration should have no adverse effects on the coal boiler." 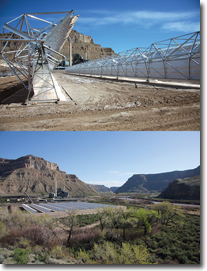 The Cameo plant was an ideal demonstration site because southwest Colorado is such a sunny spot-it even has better solar resources than Spain. "Colorado has high altitudes with good solar resources," says Price. "If you're integrating solar into coal or gas plants, the economics are likely to pay off." Xcel, which has power plants in other sunny areas like New Mexico and parts of Texas (all with potential opportunities for integrating solar power), would consider additional solar integration projects in the future, if the demonstration is a success. Xcel and Abengoa Solar already have a good working relationship. They are founding members of Solar TAC, (The Solar Technology Acceleration Center), the largest integrated, world-class test facility for solar technologies in the United States. Solar TAC provides a spot for the solar industry to research, test, and validate their solar technologies. "It's located near Denver International Airport in Aurora, Colorado," says Price. "They have 74 acres (and over 300 days of sun a year) to try out new technologies." Solar TAC includes facilities to test both photovoltaic and concentrated solar power (CSP) technologies, including access to the grid. "We're working with the Electric Power Research Institute (EPRI) and national laboratories like the National Renewable Energy Laboratory (NREL)," says Price. But Abengoa Solar also has its own R&D. They have an R&D facility in Lakewood, Colorado, where they are presently conducting research on advanced solar thermal electric technologies. Abengoa is currently building two natural gas hybrid solar plants, in Algeria and Morocco. Both are new natural gas combined cycle plants, and Abengoa is adding 20-MW solar fields to each. Price says that although it's easier to start from scratch, especially where there is land and light available, it's often still economical to retrofit an existing power plant to take advantage of solar. "There are literally dozens of power plants throughout the U.S. southwest that would be good candidates-50 MW of solar or more on some," he says. Integrating parabolic trough technology offers a cost effective way to integrate solar into the grid-whether it's a coal or potentially even a nuclear plant. "If you're adding a 50 MW solar addition to a big coal plant, I would say it probably has a payback range of 5 to 10 years," says Price. "Or alternatively, it would cost about 70 percent of what it would cost to build a stand-alone plant."